The Philadelphia Area Archives Research Portal more than 5,000 collections from approximately 200 libraries, archives, historic sites, and historical societies in the greater Philadelphia region. 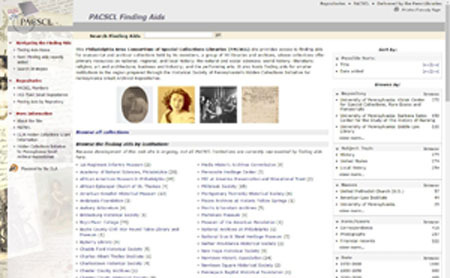 It contains the 171 collections representing 5,526 linear feet of manuscript collections, processed during the two Hidden Collections Processing Projects funded by the Council On Library and Information Resources, as well as other finding aids created by PACSCL member libraries before and after the project. The portal also contains additional records from dozens of smaller institutions in the greater Philadelphia area, from the Historical Society of Pennsylvania’s project, “Hidden Collections Initiative for Small Archival Repositories,” funded by a grant from The Andrew W. Mellon Foundation. Database hosted by the University of Pennsylvania Libraries.